Having said that, I’ve crunched the numbers and I would be better off (if I favored optimization over convenience) by spreading out my accounts. For example, investing directly with Vanguard, using a Chase CC and opening an online savings with Synchrony, GS or Ally. But, having everything in one place keeps it simple for me. How would direct investing with Vanguard save money? Do you shun ETFs? We do not use BoA's Merrill Edge programs at all, since they cannot hold Vanguard's Admiral mutual funds and we don't use any ETFs. You might want to take a look at ME again. I transferred VTSAX and VTMSX from Vanguard to ME. Both are Admiral funds. I don't know if they will accept all Admiral funds but they took these. I don't plan to sell any shares so I'm not worried about any transaction costs. I just plan to leave them there to keep me qualified for Preferred Rewards. -in california, they were giving .25 and .5% off your new mortgage rate (yes the rate, not a rate credit) if you transferred over 250k or 500k, this was on top of the merrill sign up bonuses. this was a no brainer for clients with an etrade or TDA account since they got cheaper stock trades, and good savings on the mortgage. -spousal IRA cannot be added for PR benefit rewards, but you can sign a spousal IRA POA and it will merge the spouse IRA on your online, so you can see all the accounts under one login. -their cash card (the red one) has a signup bonus that gets the 75% boost, but the travel and the premium card signup bonuses do not get the boost. i believe the OP from years ago asked about how they make money if you basically just use their credit cards and free etf trades and don't keep high balances in cash, they make money off margin loans on your positions to other clients. I am not sure if this is true. I believe the travel card does get the 75% boost if you are a Preferred Rewards Platinum. Can someone verify that? i have preferred rewards but never bothered getting a safe deposit box. What are people storing in there? Mine is full of gold and silver. Diamonds are more space efficient, so you don't have to upgrade your box. Sorry to say the the initial comment is accurate. The way the cash card works is that the Platinum Honors bonus(75%) gets applied to any redemption of accumulated rewards into your BOA bank account (or Merrill Edge CMA account). So, if I've accumulated $100 in rewards and redeem it into my BOA checking account the actual deposit will be $175. When I got the Cash Rewards card it showed a $200 sign up bonus on the card but, once redeemed, that became a $350 deposit. The Premium and Travel cards generate the Platinum Honors bonus points on each monthly statement. So the sign up bonus for each of those is the advertised amount (50k or 20k points) with no additional boost. I posted before about asking BoA for a small safe deposit box (which I should get free as I am Platinum Honors). I tried 3-4 branches, but they all said they had none available. A little frustrating. I don't have status at another bank to get a free box. I did get callbacks from almost all branches asking me about investment possibilities -- etc. etc. You’re spot on that I wouldn’t save money. I thought I would be “better off” with the ability to automate contributions into a portfolio. Merrill Edge accepted three out of my four Vanguard Admiral funds when I transferred accounts from Vanguard to ME in 2015. Only one fund (Vanguard Emerging Markets Government Bond Index Fund Admiral Shares VGAVX) was turned away by ME as they said they could not hold it. No problem -- I just liquidated it from my Vanguard IRA and then bought a comparable Vanguard ETF at ME using the proceeds, with no commission or fee at either end. Three years later, I’m still happy with my move from Vanguard to ME. It provided me the banking and credit-card perks of BoA’s Platinum Honors level, which are better than I could find elsewhere. At ME I like the free research reports, including Morningstar's. The cash bonus for opening the ME accounts was nice, too. I merged skseud's thread into here. Three years later, I’m still happy with my move from Vanguard to ME. It provided me the banking and credit-card perks of BoA’s Platinum Honors level, which are better than I could find elsewhere. At ME I like the free research reports, including Morningstar's. ME has Morningstar research reports (for MFs or ETFs) ? I don't see them. ME does have research reports (including Merill Lynch reports) for many stocks. Yes, “profile” reports for mutual funds and ETFs alike. But it’s similar to what you can view for free on the Morningstar website. Just look for the quote feature and enter a symbol. If I enter VTSAX for example I am offered a Morningstar “profile” which is a three-page pdf file with a recent date. This works with the ME mobile app and the ME website accessed with a desktop computer and browser. I found them. But, as you say, these are the same as the data available on the free Morningstar website. 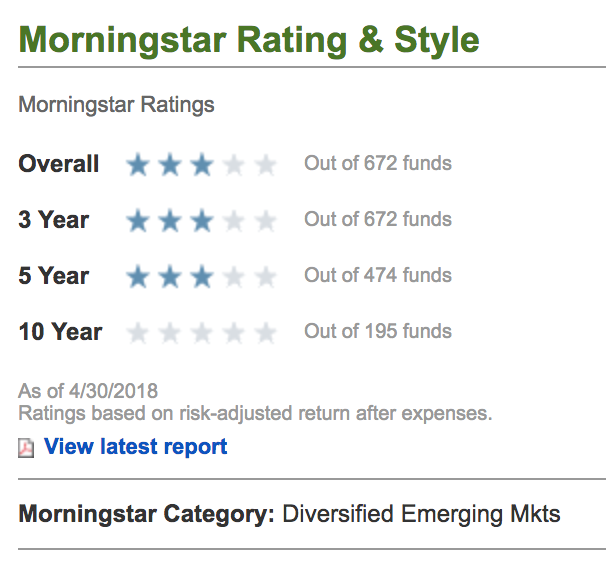 Morningstar has analyst reports for several larger ETFs and funds (i.e. they include some commentary by humans). Unfortunately, ME doesn't seem to have those. Scottrade used to have them, but after the merger with TDAM, they don't any more. What I'm curious about is if her new ME IRA balance would be combined with my existing accounts (IRA and taxable) for Preferred Rewards purposes. If they are kept separate then moving her IRA to ME doesn't make much sense. Feedback appreciated from anyone who has ME accounts in their name and their spouse's name. "Each individual has to qualify and enroll within Preferred Rewards. Eligibility is based on accounts in which the individual is listed as an owner. Accordingly, using a jointly owned Bank of America checking account you would qualify for the Gold tier within Preferred Rewards with an individually owned IRA worth $25,000.00. Similarly, your wife would qualify for the Gold tier within Preferred Rewards with her individually owned IRA worth $25,000.00." So the answer is "no," spouse IRA balances can't add together to reach a higher tier of rewards. my wife and I have our taxable account listed as a Joint CMA, so it 'counts double.' when combined with my IRA it pushes me over the top tier and when combined with my wife's IRA it does the same. we just switched our accounts over a few months ago and so far so good. we've received the account bonuses and just signed up with the cash back rewards credit card because we now get a 75% boost to all cash back rewards. so, you should make your taxable account a joint account if it is not already. Thanks for the feedback. Since my initial post in February I had called a rep at ME and been told that as long as our BoA accounts were jointly held, all BoA and ME accounts including both our IRAs would be included in my Preferred Rewards balance. Apparently that information was at least partially incorrect. Since I am the primary for our BoA credit cards, the goal is to keep my total balance over $100K. Since my wife's IRAs will have no impact on that, no rush to move her money over. One thing I just realized -- Merrill Edge with preferred rewards has no fees on incoming wire transfers (and for international for platinum and platinum honors). Meanwhile, Marcus Online Savings has no outgoing wire transfer fees. Therefore this is a frictionless and fast way to execute a transfer between the accounts. I buy on margin and initiate an ach transfer in on T for the amount of the margin debit. No interest. That's a good idea; I have never had a margin account before (but I could always ask ME to change my account type), I'm not sure if there are any downsides. Is it pretty seamless? I have margin accounts at several brokers and have not seen any downsides in practice, other than brokers using different terms and moments of slight confusion on my part. I always ask for margin when I open an account. I think Bank of America / Merrill Edge is the best mortar banking/investing combo out there. It sure does beat Chase or Wells Fargo. Bank of America Checking and Savings aren't anything special but do get the job done. At the platinum honors level ($100k+) you get a lot of perks like waived ATM fees and free checks and what not. Bank of America Cash Rewards credit card is really good, with the PH level like everyone mentioned you would get the 5.25% on one category of choice, plus 3.5% on markets and Costco (which ironically is better at Costco's than it's own card) and 1.75% on everything else. If you get over $100k in combined balance, ME gives you 100 commission free trades a month. You can but 1 ETF 100 times and have no fee. As everyone mentioned, the balance limit is the combined balance at Bank of America and Merrill Edge, so if you move over your IRAs to ME, and if that combined with your checking doesn't get you to $100k, you can put money in the ME CMA account and call them to move it to the preferred deposit which currently nets you 2.07%. However, you need $100k to open it, however, you can take money out after. So a workaround is to put in $100k, then take out $99k, you can still have the preferred deposit. You can add more money anytime, but you need to do so in $1000 increments. And, like everyone mentioned, the annoying part is they only do transactions over the phone. Currently if you are a rewards customer, if you move $200k into their CMA account or an IRA, you get $900 bonus after 90 days. I believe if you do both then you can get $1800. But you have to make sure you use the promo code when you do it to make sure your account gets coded for it. Note that Costco does not accept the BOA Master Card so you need the BOA Visa card if you want 3.5% at Costco. Not a problem with with BJs, etc. I am thinking of exploring ME's offer of $900 bonus for $200K+ new money. You do need the checking account. However, you don't need to use it. I opened it with $25, which I think they said was a minimum at the time (DON'T rely on my memory). What Earl said. Also, it's a 75% bonus, not 50%. As others said, you do need a checking account, but I believe all fees and minimums are waived for Platinum Honors clients. I have a savings account there that I don't use, but they never charge me a fee on it. Right, missed that. The 75% gives you 5.25% on the top category, which has a number of options these days rather than just gas. 3.5% on groceries. What is this preferred deposit of neting 2.07 % ? As everyone mentioned, the balance limit is the combined balance at Bank of America and Merrill Edge, so if you move over your IRAs to ME, and if that combined with your checking doesn't get you to $100k, you can put money in the ME CMA account and call them to move it to the preferred deposit which currently nets you 2.07%. then you can get $1800. But you have to make sure you use the promo code when you do it to make sure your account gets coded for it.